Paul Reed Smith returns bringing Paul Miles, the head of Private Stock at the company. The pair will discuss the company’s history, its current projects, and will provide insight into the private stock program, where you can specify a custom order PRS guitar of your own. There will be opportunities to meet them both, who will gladly take pictures and do signings if you wish to do so. Furthermore, there will be an opportunity to see one of PRS most talked about and exciting models in person before it hits stores, so don’t miss out! 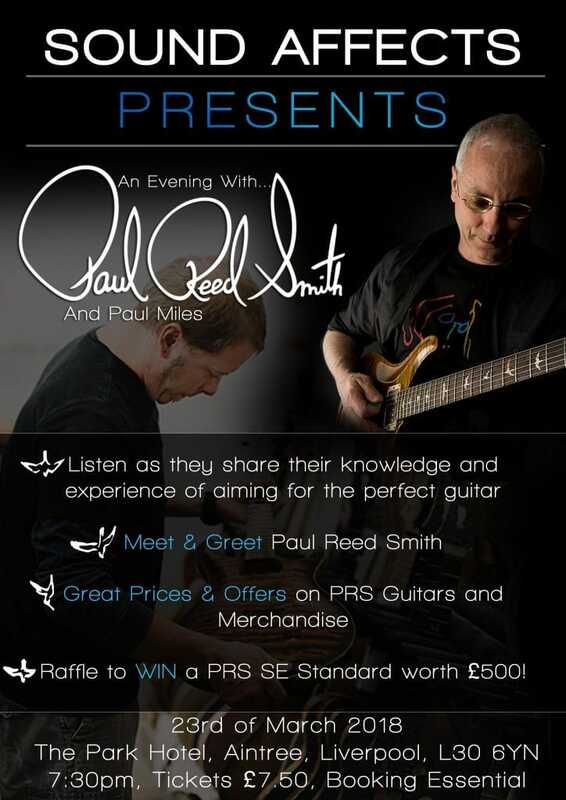 On the night there will be lots or PRS Merchandise available, as well as PRS guitars at event prices. The event takes place at the Park Hotel on Dunnings Bridge Road, L30 6YN, which is within a short distance of the M57 and the M62. There is also easy train access, with Old Roan and Aintree stations being a 15 minute walk from the Hotel. See the map below for location and directions. Tickets will cost £7.50 per head, and booking is essential due to high demand, so don’t miss your chance to attend!